These are GORGEOUS! The tomatoes are so vibrant. I eat a tomato every day, like most people have an apple a day :) And I eat brussles almost every day. I totally need these! Pinned. I cannot believe your oven broke. Over the holidays. I remember your oven drama from a year or two ago. The timing. I feel for you!!! Ahh sorry to hear about the oven situation! What a bummer! 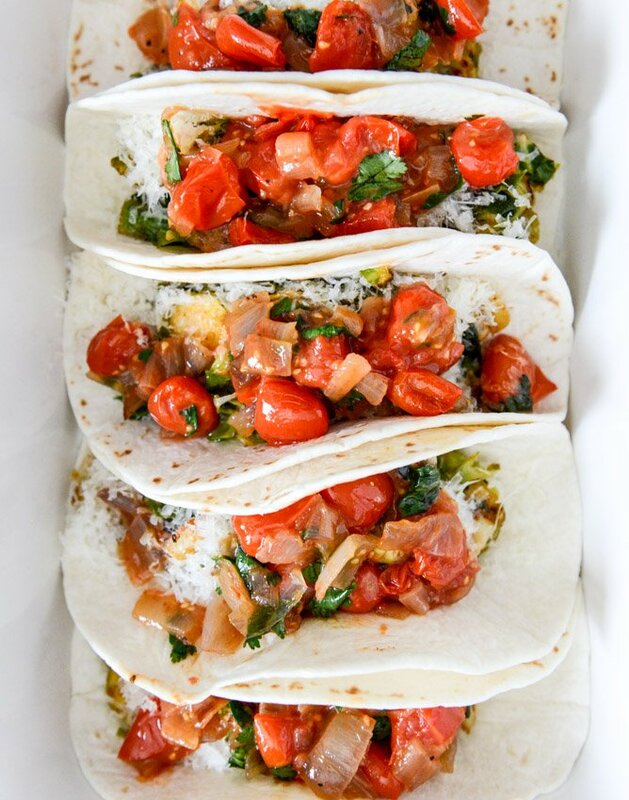 But these tacos, and yes I think we can call them that, look divine! Love the smoked paprika in there, I could put that spice in ev-ery-thangggg! A very odd taco, but I LOVE it!! I have been on a sprout kick and I can’t stop! I have all of the ingredients and can’t wait to make this. I’ll make my Hubby hot dogs tonight and I’ll make your tacos! Awesome recipe Jessica! I am excited for dinner tonight!! I am so glad that you made these. And that you finally got an oven! That sounded tragic. And yeah, I pretty much have to stop myself from having n entire bottle of TJ’s gummy vitamins all the time. It’s a daily battle. LOL – oven apocalypse 2013 and the gummy bear/vitamins comment – thank you for making me laugh this morning! Hopefully your new oven arrives asap, but in the meantime, I’m totally ok with Brussels sprouts in tacos. In fact, I think it’s genius! I’m with you on the brussels obsession! I LOVE the idea of putting them in tacos! These sound incredible. I have a bag of them waiting for me in the fridge – perhaps this is the perfect way to use them up. Sounds delicious to me! Love brussels in any form. Real talk: I just ate them for breakfast. Oh my gosh freaking gosh, YES!! Love the Brussels and I would eat thin in anything! I’m super into this, brussels sprouts in alllll the things! wow, what a crazy idea, but i LOVE it. They’re my favorite favv veg though so I may be biased. even still..this is fantastic. even my hubs said he’d eat these for din tonight! oh oh..and we’ve temporarily been living in a hotel while my husbands in training, we move in 33 days (YESSS), but my point..we’ve had no oven since September. It’s a miserable experience..I have a list going of all the things I want to make the minute I step foot into a normal kitchen. with an oven, so I can TOTALLY feel your pain. 5 months without an oven is no joke. dude. i so can’t complain about my oven now. ha. i’m so sorry! I remember when my oven broke too. I was in the middle of making a pie too! I was almost not sane without an oven, I even tried to turn my convection microwave into one… Yep I went that crazy. However These tacos would definitely distract me from those problem even if is only for 10 minutes! yum! these look amazing! I love brussels spouts! These look amazing, never been a fan of sprouts but have to give them a try now. my oven broke right before the holidays too! serious panic attack. my landlord replaced the part it needed and my husband fixed it just in time for me to finish work…but now I’m in full-on pack-the-kitchen-mode and I am already tired of take-out. 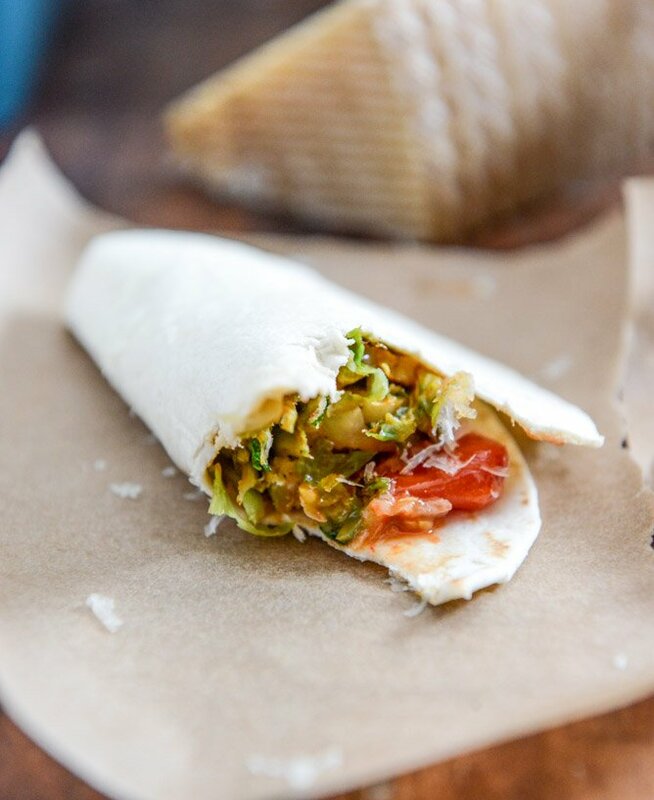 also, I totally support this brussels sprouts taco situation. why not?! These are def tacos! Yum! So, one of my New Years’ resolutions is to make more trashed-up tacos. Possibly the only resolution worth sticking to;) These fit the bill perfectly! I would call these brussels blankets…anyways sorry to hear about oven apocalypse, I think mine is heading that way…undercooked and over-browned cookies on the same tray do not bode well! Gorgeous. And glad hubby enjoyed too. Simply incredible! These are being made tonight. That salsa just brings the sprouts over the top. This is delicious! 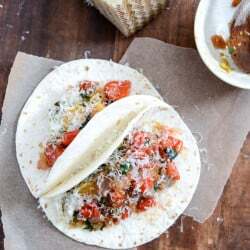 I love Brussels sprouts and adding them to a taco is genius! Love these vibrant photos! And, I’m totally down for brussels in my tacos. I love that you refer to these as trashy tacos. When I make them for my family, that is what I will be referring to them as. I’m totally down with these. And I just happen to have brussels sprouts and tortillas in my fridge! A great meatless monday dish! 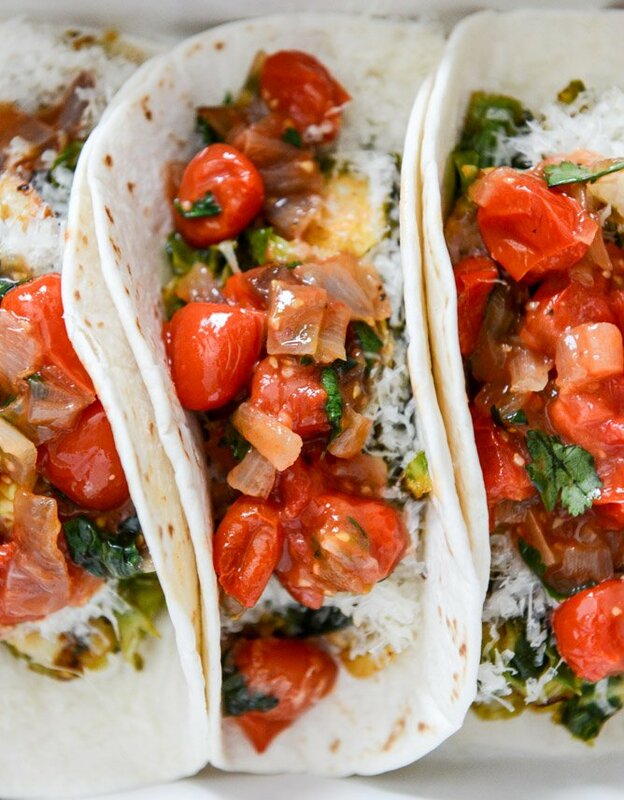 Tacos are SO versatile, it’s great to pack them with veggies. Adding a few slices of chicken to appease the hubs would work beautifully here, too! Just when I thought it wasn’t possible for you to come up with another crazy idea for Brussels, you go and do this! Rocking my world, that’s what you’re doing! Wow! 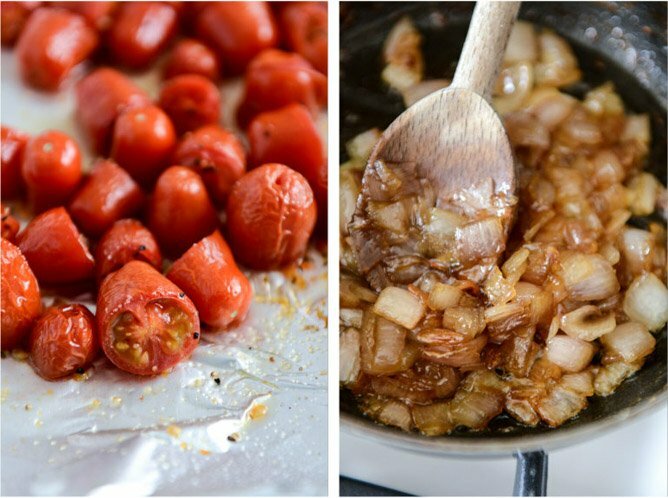 and caramelized shallot salsa? i die. Have you used the boscia masks? They’re so FREAKING AMAZING. Of course you have. i haven’t! i’ve seen them and have seen people talk about them, but never tried them myself. do you love them? which one?? you, of all people, need an oven that works!! I’m feeling nervous about brussels sprouts AND tacos together … but hey, if you say it’s good then i’m going to have to go for it. HAPPY NEW YEAR!!! I would eat almost anything in a taco, and this definitely counts as something that I WOULD. Ugh. Can’t get enough. *side note* why do guys wear althetic pants or shorts without chonies? Like, I didn’t need to know your religion by seeing your nether regions. I think I am in love. I simply cannot wait to try these!!!! Confession time – I’ve never eaten a Brussel sprout (we never ate them as a kid as my mum didn’t like them) and I’m scared of them. 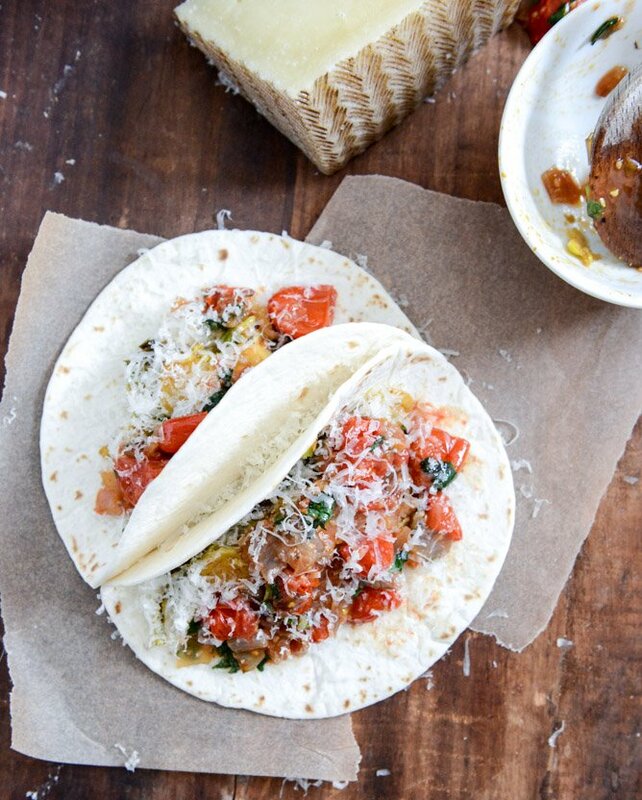 But this might be the gateway taco that I need to try them. I LOVE caramelized shallots! I actually like most vegetables, but don’t like cooked cabbage (raw is fine), which makes me think I won’t like Brussel sprouts. But maybe it’s time to be brave. hmmm if you don’t like cabbage, not sure you’d like brussels… BUT – you should definitely try them with some bacon and balsamic vinegar first. to.die.for. yesyesyesyesyes. I can definitely see myself eating this with some chips and guacamole, or maybe some queso. In love with brussel sprouts lately, and trying to reduce my meat consumption. Awesome recipe, girl! These are out of control, but i’m totally in love! These are delicious. I love brussel sorts but the tomatoes are what make this! I modified to make vegan with no cheese, used sweet onion instead of shallot and left out the brown sugar… I will make these again and again!! so happy you already made them! I need these in my life. thank you! You can call these whatever you want as long as your sharing…! In <3!!! Don’t leave us hanging…did I miss what kind of stove you bought. I have a love/hate relationship with mine and would love to replace it. Love your blog! haha! unfortunately i didn’t get anything fun/too nice. our kitchen is pretty small and without demolition we can’t really change anything, so we just got exactly what we had before and it’s almost bare bones. hopefully within the next year i’ll have a bigger kitchen and a nicer range! i’d love a thermador or kitchenaid one. These sound oddly, absolutely delicious and I must try them!! 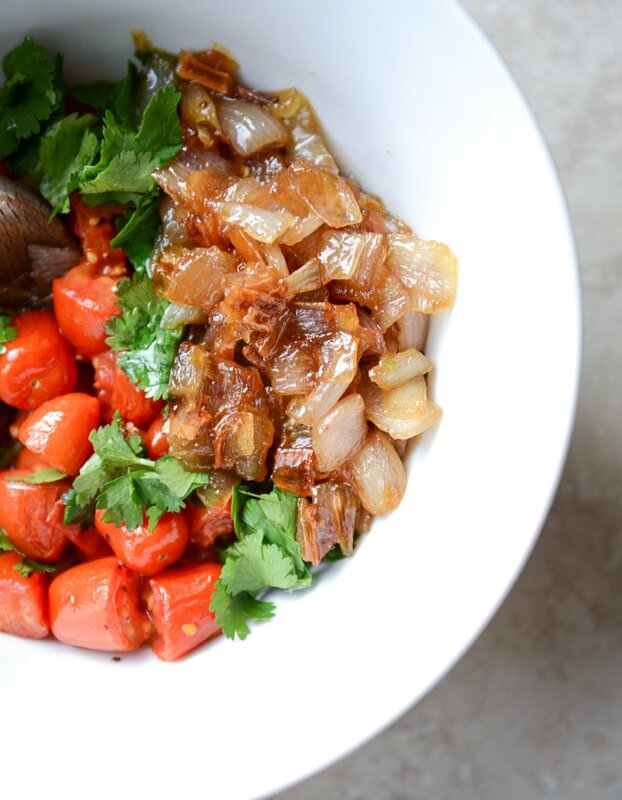 Mmm, caramelized shallot salsa…you know how to make a girl excited. Pinned! I hope your keeping warm in this brutal cold. I can send you one of my Recycled Cashmere Scarves if you want. I sold alot this winter!!!! Getting a new oven is so exciting and keeping it clean ,i hope your getting a gas stove,keeping the flat black glass is a PITA! Bake some no knead bread! Oh and don’t forget to get yourself a new saute pan! I can really fool the kids with this one, looks amazing. An oven apocalypse during the holidays sounds horrible! Almost as bad as a real apocalypse. ;) Love these tacos! I’m not a huge brussels sprouts fan, but on tacos? I’d probably eat them more often! I fell in love with you all over again today. These are my jam x 100. Happy cooking in the new oven sweetie! Wow! This is a great idea, my favorite tacos are cauliflower at our local spot so I bet these aren’t too far off. 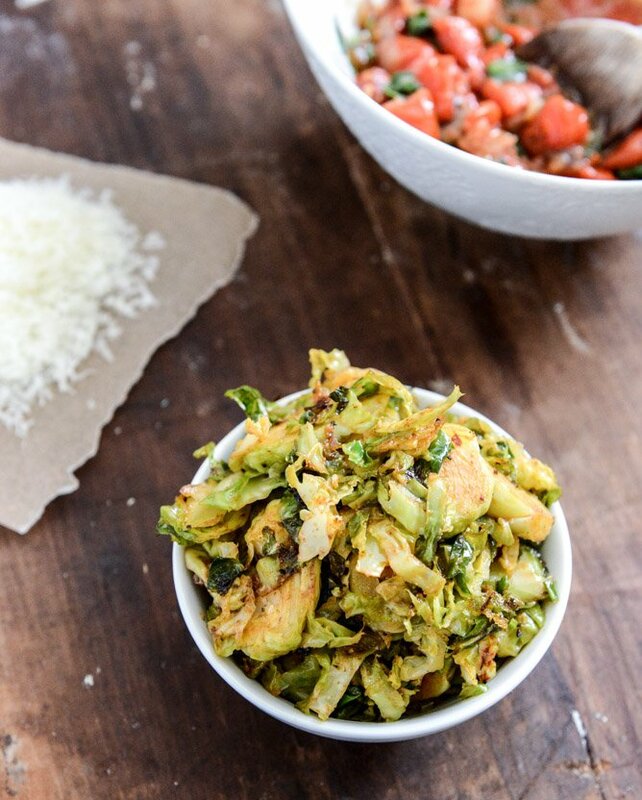 Brussels sprouts are so good for you, that I’ll definitely take them in my taco! Yum! Mmm … what a lovely idea! 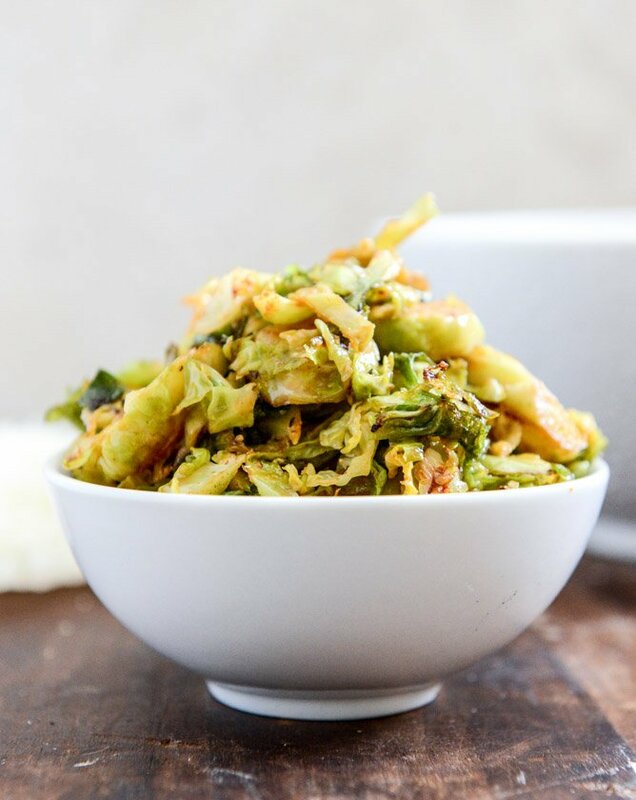 I love crunchy pan-fried brussels – they remind me of crispy Asian seaweed a little, if you’ve ever tasted that! The idea of pairing them with cheese etc. sounds lovely – I’ll have to try! I love brussels sprouts. I would put them in everything too, this looks great!! My heart skipped a beat when I read the title of this post. Good grief! Tacos have never sounded more appetizing.